With the 2015 NFL Draft coming in hot later this week (Thursday to be exact), it seems like a good time and analyze how the teams that selected in the first round a year ago did. Let's take a look. 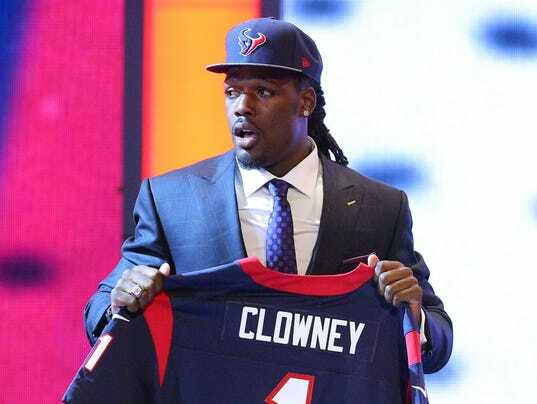 Hopes were high for Clowney not just because he was the top player in the draft but because he was going to team with J.J. Watt to form a truly fearsome pass rush but ultimately, his NFL debut was a disappointment. Clowney struggled to stay healthy all season long and only played 143 snaps on the season in four games. Therefore, it is hard to grade his rookie season considering that he played a little but now one has to hope he can show the skill that made him the top selection. The Rams sought to further improve their offensive line by using the second selection on Robinson, but ultimately, the line was a disappointment once again this season as was Robinson. The hopes were to let Robinson develop at guard before moving him to tackle down the line but he was thrust into the left tackle spot after the injury to Jake Long and he ultimately showed that he was not ready as he struggled. He can still develop into a quality tackle but there is still some work to do. The Jaguars using this selection on Bortles was a big surprise at the time and he had himself a pretty mixed rookie season. There was not a whole lot of talent around him, particularly with the line in front of him, and Bortles did have some growing pains as he came within one interception of leading the league. He did show some promise with a strong arm and plus athleticism but ultimately he will have to take better care of the ball. I still do not love the Bills trading this year's first round pick in the move last year to trade up for Watkins but Watkins did give the team a much-needed boost at the position. He did struggle at times with injuries and ultimately did not get a great deal of him from the quarterback position but he showed all of the skills that made him a top five selection. If new coach Rex Ryan can find better production from the quarterback position this year, Watkins could have a big season. My pick for Defensive Rookie of the Year last year was rated by the good folks at Pro Football Focus as the best outside linebacker in the NFL last season. Mack showed a really promising all-around game as he performed very well in both the past rush but also in pass coverage and run defense. Oakland's defense still was not very good at all last season but it looks like they have a future star in their unit in Mack. A disappointing offensive line for the Falcons got even worse last season even after drafting the highly-touted Matthews in the first round as he was a disappointment. He had to make a quick adjustment to left tackle in the preseason and played hurt all season long and ultimately was truly a mess in pass protection. One should expect improvement with greater experience as well as improved health but it will be key for an Atlanta team to improve that he does as such. In what was a trainwreck of a season for the Buccaneers, Evans may have been the biggest bright spot as even with a season-long shuffle at quarterback, he was able to develop as a big-time playmaker, especially down the stretch. It will be a shock if the Buccaneers do not select a quarterback (namely one from Florida State) with the first overall selection and regardless of which quarterback it is, he should be able to help Evans further develop into a star. After trading up after trading down to select Gilbert, the hope was that he would team with Joe Haden to form an elite cornerback pairing for Mike Pettine's defense. Ultimately, Gilbert was a big disappointment all season long as he was unable to secure consistent playing time. He really got out of the gate poorly and he was dogged by maturity questions as well, leading to a Week 17 suspension. The skills are there but he is going to have to take a big step forward next year. Barr seemed to be entering the NFL as a little bit of a project considering he had only played a couple of seasons on the defensive side of the ball. However, he made an impact immediately for the Vikings and looks like a force on their defense. He did only play 12 games due to some injury issues but he was able to rack up 70 tackles, four sacks and two forced fumbles. Barr did miss a good amount of tackles in the second half of the season but that should improve with experience. The Lions selected Ebron was part of an organizational effort to build a deeper supporting cast for Matt Stafford beyond star wideout Calvin Johnson but ultimately, Ebron did not have that big of an impact. He did not have any games with more than four receptions or 34 receiving yards, had only one touchdown on the season and had a longest reception of only 22 yards. Ebron will have to show more comfort with the system next year if the team is to justify their selection of him this high. The 2014 season turned into a dumpster fire for the Titans but one of the few bright spots for the team was the development of Lewan at left tackle. It was a funky pick to select Lewan when they already had Michael Roos and had just signed Michael Oher but he performed well after taking over for Roos after he was lost for the season in Week 5. Lewan did have to battle some injuries late but he looks like a safe bet to be the team's future on the blind side. Beckham had a bonkers rookie season by any stretch but it is made even more impressive considering the fact that he only played in 12 games and did not have a great deal of help opposite him after Victor Cruz was lost for the season. Not many players come right in and become a star right away but that is what happened with Beckham and it seems only a matter of time until he could become the best receiver in the NFL. St. Louis found much success with their second first round pick with Donald becoming the Defensive Rookie of the Year. Even after not starting the first four games of the season, Donald was rated as the best defensive tackle in the NFL last season as per Pro Football Focus. He racked up eight sacks and excelled against the run and with his skill-set, he should become a consistent Pro Bowler at his position. Fuller started his rookie season with a bang with three interceptions in Chicago's first three games but then he did not get an interception until Week 16. He showed some growing pains in coverage over the course of the season, the likes of which are not all that surprising for a rookie defensive back. Fuller has the skills to become a very good corner and his ball skills are already a plus. Shazier only played nine games as a rookie with only five starts thanks knee and ankle injuries and on the whole, his numbers do not look all that impressive (36 tackles). And if he is going to be a contributor for the Steelers, he is going to have to stay healthy. That said, he did show some game when he was on the field, particularly with a very nice start. With improved health and experience, he should turn into a player. It is not that often that a lineman will get some pub for Offensive Rookie of the Year but the away may have been Martin's had Odell Beckham Jr. not blown up last season. He was that good for the best offensive line in the NFL last season and a key reason why DeMarco Murray had such a great 2014 campaign. Should he stay healthy, he looks like a lock for yearly trips to Honolulu. Mosley was in the mix for Defensive Rookie of the Year last year and it was easy to see why. He was sensational stuffing the run for one of the best rushing defenses in the NFL but he also showed skills defending the pass and in rushing the passer. For a team that had struggled to replace Ray Lewis in the middle of their defense, Mosley seems to fill the void pretty week. There really was not that much to like in the putrid Jets secondary and Pryor gets the benefit of knowing that he was not the worst player in the mix. Pryor did not make too many big plays and struggled with his tackling at times. Not to mention that getting benched midway during the season was not exactly a great sign. To be fair to Pryor, he largely spent 2014 playing out of position and with a former defensive back in Todd Bowles taking the reins in Florham Park, there may be hope yet. James was a reach for a team that had significant needs on their offseason but ultimately their gamble paid off as James had a really nice season. He helped to plug a big hole at right tackle and then was able to shift over to the left side after Brandon Albert was lost for the season and that's not as easy as it seems. He should be a long-term option on either side. In what was a really disappointing season in the Big Easy, and especially so offensively, Cooks had to be one of the few bright spots. Only playing in ten games before being lost for the season with a thumb injury, Cooks showed some pop in the slot and was connecting well with Drew Brees. Should he be healthy in 2015, he could very well have himself a big season particularly in the wake of the Jimmy Graham trade. Clinton-Dix showed a little bit of everything as a rookie, not necessarily all good, while filling a variety of roles for the Packer defense. He has given up his fair share of big plays and could tackle better at times but he has also shown some range in the deep secondary as well as the ability to deliver some big hits. He could use some more consistency but he may have solidified a position that has been a revolving door in recent years. Even as Brian Hoyer's performance declined over the course of the season, the fact that it took until Week 15 to give Manziel a shot under center probably was a sign in the team's lack of confidence in him. When he was given a shot, Manziel really underwhelmed before suffering a hamstring before halftime in his second start. And the maturity concerns never subsided and he still has left much to be desired in that regard even after a stint in rehab. He's got a long ways to go before showing that he belongs as an NFL quarterback. Ford was a reach last season and considering his non-existent rookie campaign, he has yet to shed that label. While it does make sense that Ford not see that much playing time behind Tamba Hali and Justin Houston, he struggled to stick in the rotation as he faced a tough transition to being an outside linebacker in a 3-4 defense. With Houston still around after being hit with the franchise tag, it is tough to see Ford making much of a difference going forward. Similar to Ford, Dennard really struggled to see a lot of playing time behind a trio of veteran cornerbacks even on a mediocre pass defense. All in all, he only played 61 snaps over the course of the season. However, defensive coordinator Paul Guenther did say that he should have played the Spartan product more last season and with the departure of Terence Newman to Minnesota, we likely will see a lot more of him this season. Verrett was putting together a really nice rookie campaign before being lost for the season in November with a torn labrum. Cornerback is one of the tough positions for a rookie but Verrett showed that he belonged right away as he showed a lot of coverage skills while also looking like he could be a good player in the run game as well. Look for more good things over a full season going forward. When I made my initial draft grades a year ago, I thought this was a nice reach for the Iggles and I still think that way a year later. Smith earned the project label as he didn't seem ready for playing time in 2014 and only saw action in eight games and none after Week 12. And considering you have Chip Kelly saying he had little sway over the decision to pick Smith, that does not reflect too well on his future in Philadelphia. Bucannon did not make a huge impact as an every-down player for the Cardinals but where he did make his impact was as a a hybrid safety-linebacker in Arizona's "Big Nickel" schemes that found a lot of success. He was a big factor in the box and he delivered some big hits. What will be interesting to see from Bucannon going forward is if he can be more of a traditional safety as the club intends to use him more as this season. I was not all that high on Benjamin coming out of FSU but he impressed me as a rookie namely as he came and made a big impact for a receiving corps that sorely needed an impact player. In fact, he was in the mix to be Offensive Rookie of the Year before Odell Beckham went off. Cam Newton still could use more weapons but at least in Benjamin, he looks to have a potential nomber one wideout thanks to Benjamin's size and strength. While he did get to debut on a team that won a Super Bowl ring, Easley really did not make that much of an impact during the regular season before going on injured reserve with a knee injury in December. Injury issues were an issue for Easley in Gainesville and one would hope they will not be an issue for him in Foxborough going forward. One would think with more experience that he will see the field but who knows. Ward saw a good deal of action as the team's nickel cornerback as a rookie before being lost for the season after Week 10 with a foot injury. All in all, it was a bit of a mixed bag for the NIU product. He did get creamed by Brandon Marshall in the home opener but he did show some improvement in coverage over the course of the season. Should he stay healthy, he should show some improvement next year and beyond. Roby only got a couple of starts in his rookie campaign but he still made a solid impact as a corner in nickel sets. He showed the enticing skill-set that made him a first round pick as well as some nice physicality and toughness but he also was burned every now and again over the course of the season. But that is to be expected from a rookie corner so all in all, a nice debut. The numbers were not amazing for Bridgewater in his rookie campaign (2,919 yards, 14 touchdowns, 12 interceptions on a 64.4 completion percentage) but it was a very solid rookie season for a guy who saw his draft stock slide in the draft process a year ago. Bridgewater improved as the season went on and he did not do so with a great deal of help offensively without Adrian Peterson and a mediocre receiving corps. With more comfort with Norv Turner's offense, look for a big step forward from him this season.